“Our goal is to be [among] the top four teams in the province; the top four will bring us to nationals,” said Ben Painchaud, the team’s new head coach. Those may have been lofty goals in the past, but they may not be so far-fetched with Painchaud leading the way. Before taking the job at Concordia, Painchaud played golf for the Dawson College Blues from 2001 to 2003 and the Concordia Stingers from 2003 to 2006 before ending his varsity career with the Ottawa Gee-Gees from 2006 to 2009. Painchaud then spent five years working for the Quebec Golf Association as tournament director and coordinator, today working as an instructor at the Beaconsfield golf course where he also competes. Painchaud committed to giving the golf club a makeover after previous coach Pat Dearn left the team halfway through the season for personal reasons. Now that he’s arrived, the players are ready to start the new season. “The positive from last year is that generally the kids are eager to learn. They really enjoy spending time with each other and enjoy being teammates,” said Painchaud. One player who can back him up is Stingers rookie Mitchell Reade, who trains with Painchaud at the Beaconsfield golf course. “I think he’s going to do very well; he’s always looking out for the players,” said Reade. “He brought us all together, he taught us a new [approach] to the game that we didn’t have before,” added veteran Stingers golfer Daniel Abbey. “At our Rimouski tournament [last year], we arrived there the day before competition, where we played a practice round in the dark, while rushing through it. Had we gotten there a day earlier, we could have familiarized ourselves with the course,” said Abbey. The Stingers came out of that tournament tied for 20th place. But those days may be over now that Painchaud is here. One way he plans on keeping his team in line is by having regular practices in the summer—a first for the golf club. To train the golfers, Painchaud will be helped by assistant coach Philippe-André Bannon, who finished first at the 2010 Canadian university golf championship. More support will also come via Japanese golf company Titleist, which will provide the team with equipment and analytic data on the athletes’ swings. Another one of Painchaud’s goals is to put a full women’s team together, something that hasn’t been in place at Concordia since the club’s inception. “If you’re a girl and you like golf and you’re interested, please contact us,” said Painchaud. 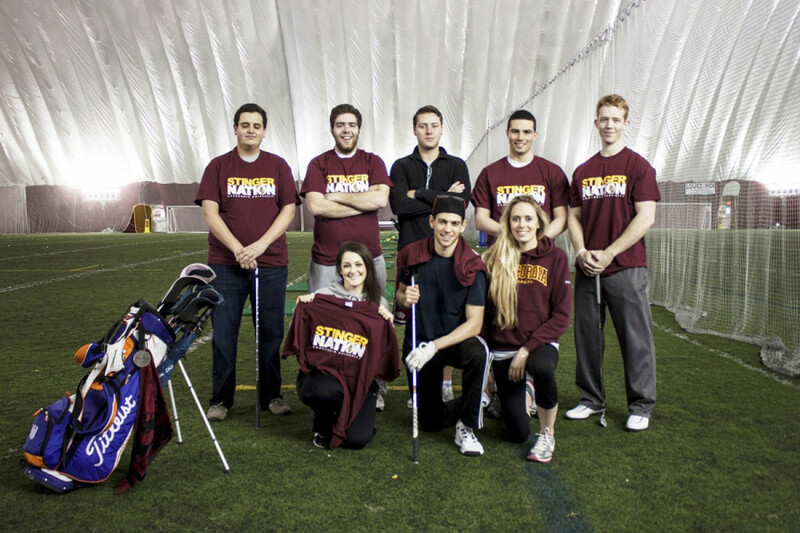 The golf club is open to all Concordia students. Practices take place every Wednesday and Friday at the Stinger Dome from 8:00 a.m. to 10:00 a.m. For more information contact Ben Painchaud at 514-608-4941 or email him at ben@whiteland.com.